The full technical, design and manufacturing story of all marks and variants of Spitfires, in all configurations and modified forms, plus the Seafire and `Super Seafire', Spiteful and Seafang. 888 photographs depicting the entire range of Spitfire marks and their prototypes. 404 line illustrations showing details of design and construction in intimate detail, most from official sources. 180 colour plans and profiles showing camouflage and markings of specific aircraft and squadrons, including Spitfires in service with overseas air forces. Appendices covering Air Ministry specifications, serials and block allocations, contracts, engines, Schneider Trophy floatplanes, and camouflage and markings. 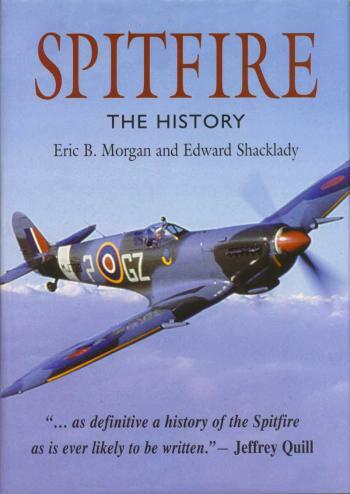 Concise individual histories of the vast majority of Spitfires and Seafires produced. An invaluable documentary and pictorial resource for the aviation enthusiast and researcher, and the ultimate reference book for the modeller. THIS is an exceptionally well documented book. Eric Morgan and Edward Shacklady have undoubtedly had access to a unique collection of Supermarine company records, including much correspondence to and from official sources at relevant times during the design and development stages of this much developed aircraft. They have made full use of the material at their disposal to produce what must be as definitive a history of the Spitfire as is ever likely to be written. A book so lavishly documented from many original sources poses in itself a problem for the reviewer or a writer of forewords insofar that it is virtually impossible to check such a wealth of detailed information. Many of the illustrations are unique. It would be possible to criticise the book on the grounds that sometimes it tends to get bogged down under its own weight of detail and perhaps misses some of the broader interpretations. However, the authors are to be congratulated on a most comprehensive and detailed history of the Spitfire. It is there for those who care to study it. It is not a book for light reading, but will be an essential on the shelves of serious aviation historians, and anyone who wishes to study and be well informed about this remarkable aircraft which was by any standards a great national achievement. Synonymous with the Spitfire, Jeffrey Quill played a major part in testing of the prototype during 1936/37 and later, as Chief Test Pilot for Supermarine, was responsible for development flying throughout the aircraft's long career. In more modern times he has been a director of both Sepecat and Panavia, concerned with the Jaguar and Tornado programmes respectively. Now retired, he is president of the Spitfire Society.